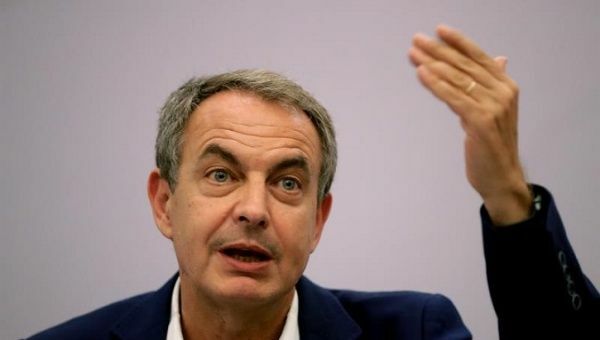 Former Spanish Prime Minister Jose Luis Rodriguez Zapatero said Saturday that the surge in Venezuelan migration is directly linked to the Canadian, European Union and the United States led economic and financial sanctions against the South American country. “Like it always happens with economic sanctions that produce a financial blockade, who pays is not the government but the citizens, the people,” Zapatero told EFE in an interview after participating in a forum in Sao Paulo, Brazil. U.S.-aligned nations and organizations have attributed what they call a “migratory crisis” to the Venezuelan government and president Nicolas Maduro, who they accuse of strangling the economy and holding on to “dictatorial” power. The government, which was re-elected by a wide margin in May, has argued the economic crisis that is pushing Venezuelans responds are a series of hostile economic and financial actions that have hampered the government’s ability to buy essential goods, like medicine and food, and that have effectively strangled the country’s finances by seizing their resources. “I must say that the intensification of the growth in emigration these past months has much to do with the economic sanctions imposed by the U.S. and that has been supported by some governments,” Zapatero stressed. The former Spanish PM has backed dialogue between opposing political sectors in Venezuela as the only way to reach political and economic stability. His latest contribution to these efforts was his participation as a mediator in the failed rounds of peace dialogue hosted by the Dominican Republic. Maduro’s government approved a series of economic reforms last month under the economic recovery plan, which aims to stabilize the economy by combating hyperinflation, reaching agreements to set prices for basic commodities, and countering networks that smuggle subsidized goods and other commodities. This comes after Nicolas Maduro survived an assassination attempt carried out using drones. The government has identified several opposition leaders, including Julio Borges, who participated in the dialogue in the Dominican Republic and decided to withdraw from the negotiations, as intellectual and material authors of the failed attempt. Zapatero is not alone in supporting the Bolivarian government’s assessment of the root causes of the economic crisis. In a recently-published report, United Nations rapporteur Alfred-Maurice de Zayas identified four key factors to explain the crisis. Three of them are related to the U.S. blockade of Venezuela: the cumulative effects of 19 years of economic war, the financial blockade like that imposed on Cuba, and the economic sanctions imposed in 2015 which aggravated scarcity. The other root cause identified by Zayas is Venezuela’s dependency on petroleum exports, which exposed the country’s economy to the sharp fall in oil prices in 2013. Oil dependency is a structural economic problem recognized by the Venezuelan government but not yet overcome.